The conundrum of vigilante justice is one that many a movie has dealt with. It's often a staple of superhero tropes but the projects that are particularly affecting which use the themes of vigilante justice are those of real people, rather than superheroes, fighting injustice. Kelly Dolen's John Doe: Vigilante takes the familiar vigilante tale and throws in a couple of wild cards. While typical vigilante stories feature heroes, or perhaps antiheroes?, who clean up the city in quiet, subdued fashion, the vigilante in Dolen's film seems determined to dole out as much violence as possible, often in public fashion. He's not working under the cover of night. This vigilante wants to send the message that the guilty aren't safe and along the way, this very public figure picks up a handful of copycats who decide it is their job to help him clean up the world. It may be a slightly different twist on the familiar story but what makes John Doe: Vigilante interesting isn't what the movie does differently but rather what it does well. Sceen writer Stephen M. Coates' script offers plenty of opportunity for grittiness and exposition and Dolen delivers a movie that is both intensely violent and an emotionally resonant piece of social commentary. In part that's achieved through editing, jumping between moments of intense, visceral violence and more tempered moments of introspection but none of it would work without the performances and this is where John Doe: Vigilante really shines. Dolen's direction was always going to elevate the project from it's low budget limitations â€“ the cinematography, editing and general aesthetic of the project far outshine the budgetary restrictions, but John Doe: Vigilante is a real stand out because of the performances. Lachy Hulme, a working TV actor, shines as Ken Rutherford, the hard hitting reporter who has been following the vigilante case and who is trying to elevate his career to the next level with his exclusive interview of the defendant. His performance is great in the moment but on second viewing, it works on another level all-together. If he wasn't already a star, one would say that Jamie Bamber, notably of "Battlestar Galactica" and "Law & Order: UK" fame, delivers a star-making turn here. Bamber, who has been great in the past, delivers a carefully constructed performance which adds dimension to a character that could easily have ended up as one sided. There's a sense that this vigilante isn't just a wronged man out to clean up the streets. There are glimpses of a man who wants attention, who wants to lead and who wants to be a catalyst for change. There's a revolutionary streak here that's not often present in vigilante tales and Bamber fills the role of fearless leader perfectly, even delivering a powerful "call to action" monologue which had me squirming in my seat. John Doe: Vigilante is far better than any one sentence plot description or cheesy poster suggests. Not only does it breathe some new life into a familiar trope, it cements Bamber as a talented leading performer who should really be appearing in more projects. 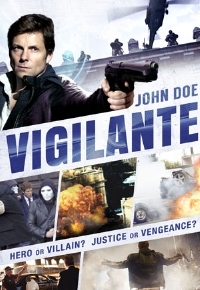 John Doe: Vigilante is available on DVD today.